The McKinsey 7- S framework is a popular model used in organizations to analyse the environment to investigate if the company is achieving its intended objectives. The name of the model can be explained by the fact that the model was developed by Tom Peters & Robert Waterman, consultants at the McKinsey & Company consulting firm. The model proposes 7 interdependent factors – 3 hard ‘S’ i.e. strategy, structure, systems; and 4 soft ‘S’ i.e. shared values, skills, style and staff. The hard ‘S’ are more tangible, easily to define and easy to influence than the soft ‘S’. Strategy – It refers to the intended sequence of actions taken by a company to achieve its goals and objectives. It deals with resource allocation and includes competition, customers and the environment. Structure – It refers to how the various business units are structured and how they communicate with each other. A company’s structure may be centralized or decentralized or may take many other forms depending on the company’s culture and values. Systems – This includes a host of systems within an organization that define its processes and routines. It includes performance appraisal system, financial systems, IT systems etc. 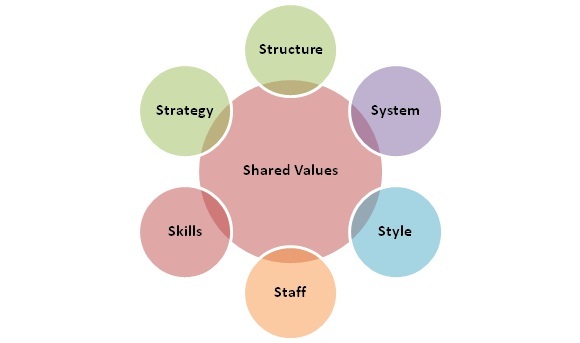 Shared values – These are the core values of the company that connect all the other 6 factors. These are the fundamental ideas or guiding principles that lay the foundation of businesses. Skills – These define the core competencies of the employees. Style – This spans the core beliefs, norms and management style in the organization. Staff – It refers to the number and type of employees in the organization. It is very important for an organization to manage its human capital to create competitive advantage.